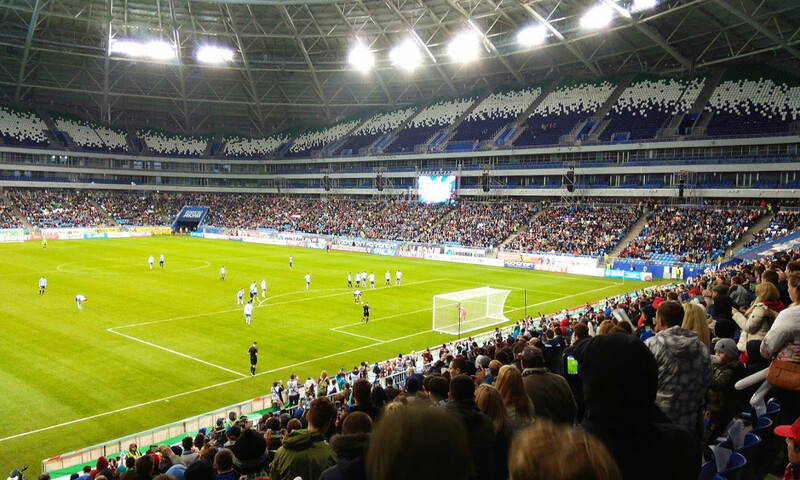 The Cosmos Arena, also known as Samara Arena or Samara Stadium, is the recently opened new home of Krylia Sovetov, replacing Metallurg Stadium. The stadium was built to serve as one of the playing venues of the 2018 World Cup. First plans for the new stadium were made around 2010, which became concrete when in 2012 the city of Samara got selected as one of the host cities of the World Cup. Works started in the middle of 2014, and following a small delay were completed in early 2018. 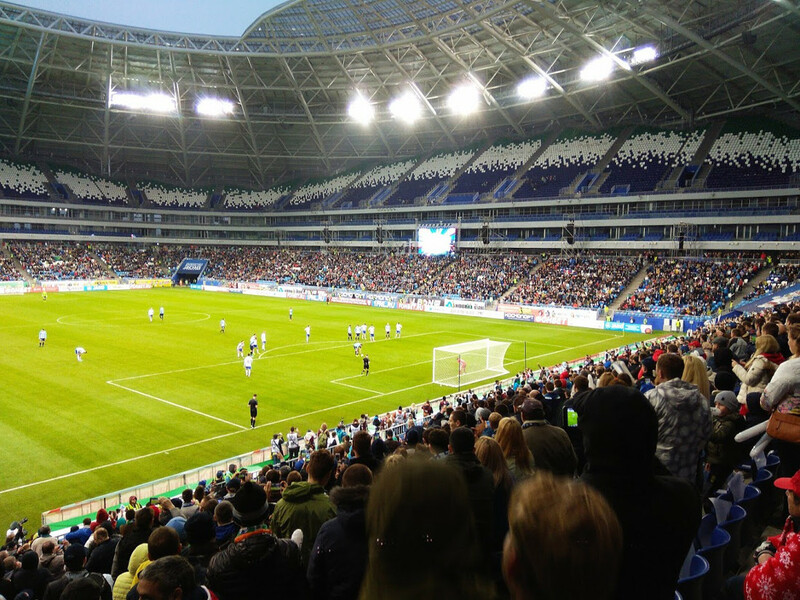 The Cosmos Arena opened on 28 April 2018 with a league match between Krylia Sovetov and Fakel Voronezh, though it was still one of three test matches at limited capacity. The most characteristic aspect of the Cosmos Arena is its 65.5 metres high dome roof, which is made up out of 32 panels. The arena boasts just under 45,000 seats, which are divided over two tiers. The Cosmos Arena was initially planned to be built on the tip of a peninsula where the Samara and Volga rivers meet, however was moved to a site north of the city due to a lack of infrastructure. During the World Cup, the Cosmos Arena is scheduled to host four first round group matches, one round of 16 match, and one quarter-final. The Cosmos Arena is located just north of the city of Samara at roughly 15 kilometres from the city centre. It is a similar distance from the railway station, which lies on the eastern edge of the centre. Currently, the options to reach the Cosmos Arena by public transport are limited due to its location outside of the city. Marshrutka 50 passes just west of the stadium on Demokraticheskaya Street. Catch the bus from Samara railway station or Samarskaya Street in the city centre. Marshrutka 1k runs east of the stadium along Moskovskoye Street, but it’s still a bit of an inconvenient hike to stadium. 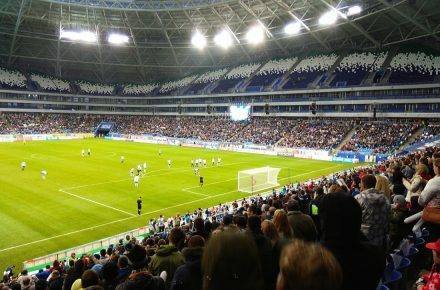 Tickets for Krylia Sovetov games can be bought at Metallurg Stadium or one of the other sales outlets, which typically include shopping centres Viva Land, Babylon (in the centre), Kosmoport, and Mega City. Expect to pay Rub. 200.00 for a ticket. The Cosmos Arena is located just outside the city. It is an area under development, but currently a mix of forests, some residential housing, roadside retail, and light industry. Overall, it is an unappealing area with little around save for a shopping mall with some food outlets a 20-minute walk away. Still, eating and drinking is better done in Samara’s pleasant city centre, in particular on the Volga river embankmant or around Leningradskaya pedestrian street. Despite its location outside of the city, there are a few hotels at walking distance of the Cosmos Arena. Dubki Hotel is a good option a short walk away, and Elyzium Hotel a more basis alternative. Almira Hotel is a little further away, but still about just at walking distance and it gets excellent reviews. Click here for an overview of hotels near the Cosmos Samara Arena. However, if you’re looking to spend a little more time in Samara, you’re likely better off finding a hotel in Samara’s city centre. Click here to explore the options. Kc-camapa.ru – Official website of Krylia Sovetov.